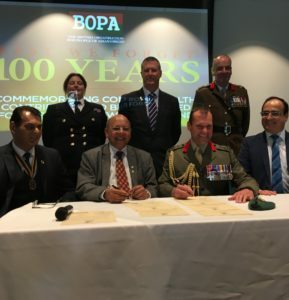 The British Organisation for People of Asian Origin (BOPA), hosted a fabulous commemorative event at the National Memorial Arboretum on 16 October. The event celebrated the contribution made by Asian members of the Commonwealth to the British Armed Forces during the First World War, and conflicts since, commemorating the sacrifices that were made during those conflicts. An audience drawn from all walks of society, faiths and cultures, and especially youth groups were gathered to celebrate and commemorate that contribution made. During the event Mr Davinder Prassad, General Secretary to BOPA; Dr Rakesh Sachdev, Chief Executive of Sachdev & Co. Chartered Certified Accountants; and Mr Ravinder Sandhu, Chief Executive of Castles Estate Agents in Coventry, took the opportunity to show their public support by signing the Armed Forces Covenant. All three Covenants were witnessed and signed by Brigadier Graeme Fraser MBE ADC RM, Naval Regional Commander (Wales & Western England). If you are interested in finding out more about the Armed Forces Covenant you can speak to our Employer Engagement team – wm-eeao@rfca.mod.uk or 0121 274 2227.